From decked out penthouses with private balconies to luxurious villas with personal butlers, there's no lack of options for living the high life in Vegas. To help you out, we've narrowed it down to our top three after spending many many nights in many more rooms. The Cosmo stands out from the rest of the Strips' high-end hotels by brilliantly conveying the boutique hotel vibe within the grandeur of a casino resort. Provocatively promoted as the "right kind of wrong", the Cosmo has undeniably emerged as the new 'it' place, with influencers, foodies, and famous faces all drawn to the hip vibe. Despite being the relatively new-kid-on-the-block, the Cosmo delivers elegance far beyond its years. 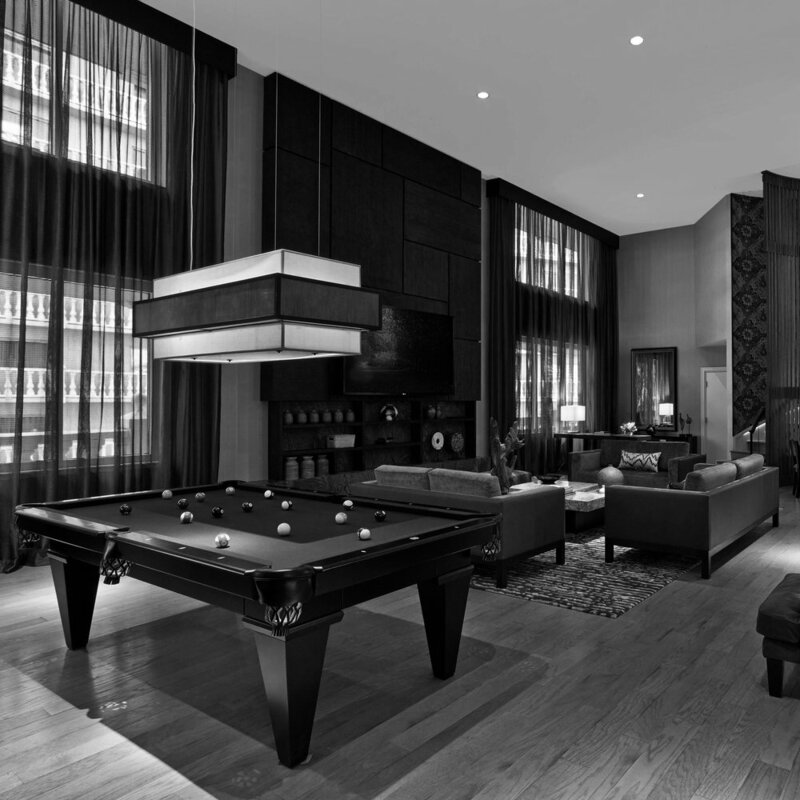 The four elite 70th-floor Bentel & Bentel Penthouses are stunningly austere, providing quite the contrast to the lower-tier rooms. Our favorites are The Foxglove, inspired by classic black-and-white movies with lighting meant to evoke spotlights and moving filmstrips and The Hemlock, which includes extras like a sit-down theater and an indoor hammock made of wolf hide. The Bungalow spans three jaw-dropping floors. Every aspect of the interior is designed with astounding attention to detail, while outside you find a huge terrace with a rooftop Jacuzzi plunge pool and unreal views of the Strip. Why we love it? Incredible on-site restaurants, amazing screen pillars in the lobby, fitness classes, a fresh vibe and stunning decor. ARIA is an eco-friendly architectural beauty with its exterior water wall, spacious glass atrium lobby, and rich design. Spoiling yourself is easy and convenient here: with decadent restaurants featuring nearly every type of cuisine, a gorgeous pool, incredible spa, luxury shops, stunning nightclub, and elegant lounges - what more could you ask for? The Sky Suites are both stylish and spacious with separate bedrooms, full living rooms, dining areas, Jacuzzi tubs... all the comforts of home - away from home. The lavish 2-story, 3-bedroom Sky Villas feature panoramic windows, butlers on hand 24/7, two in-room bars, a billiards room, VIP treatment at the club-level pool, and complimentary limos to and from the airport. This is the ultimate space either to entertain - or for privacy and anonymity. Why we love it? Big gym with tons of equipment, dark and rich casino decor, great dining with global cuisine options, and in-room tablet for easy room service. Everyone knew Nobu restaurants, but Nobu Hotel at Caesars Palace was the first of its kind. Within the behemoth of Caesars, Nobu brings a surprisingly intimate experience. Nobu's design DNA fuses Japanese tradition with Western touches, blending natural materials and textures with Vegas flair. Rooms include custom art by up-and-coming Japanese artists and an walk-in shower with black Umi tiles and a teak bathing stool, a fixture of traditional Japanese bathhouses. The Nobu Villa gives not just high rollers, but also high net worth individuals the VIP treatment. Though Vegas resorts are notorious for reserving their top suites exclusively for high rollers, a handful of these “unbookable” suites are now available at Nobu for those with the means to reserve them. Enjoy your own private deck featuring a Japanese maple tree and an onsen, a sauna and massage room, a massive terrace with its own bar, a Zen garden, pool table, and multiple dining areas including a sushi bar and an outdoor kitchen. A personal butler and priority service at Nobu restaurant also make it worth the splurge. Why we love it? Nobu's exquisite design, the zen garden for relaxation, and of course the access to previously inaccessible suites. Signup below to receive secret Vegas intel and other insider tips. Would you like to chat with us?